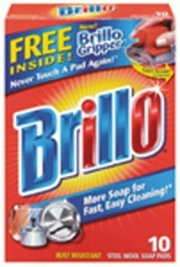 Difference between revisions of "Brillo"
[Purex Industrial] A registered trademark for a series of cleaning pad products. The original Billo [http://cameo.mfa.org/materials/fullrecord.asp?name=steel wool steel wool] cleaning pad was developed in 1913 by the Brillo Manufacturing Company. Brillo steel wood pads are composed of a fine grade steel wool pad embedded with a pinkish soap and baking powder. They were originally used to clean and polish [http://cameo.mfa.org/materials/fullrecord.asp?name=aluminum aluminum] cookware and utensils. Other Brillo products included All-Purpose cleaning pads made from [http://cameo.mfa.org/materials/fullrecord.asp?name=polyurethane polyurethane] foam and Scrub n Toss pads composed of a dual layers of white([http://cameo.mfa.org/materials/fullrecord.asp?name=rayon fiber rayon]/[http://cameo.mfa.org/materials/fullrecord.asp?name=polypropylene polypropylene]) and blue ([http://cameo.mfa.org/materials/fullrecord.asp?name=polyester fiber polyester]). [Purex Industrial] A registered trademark for a series of cleaning pad products. The original Billo [[steel|steel wool]] cleaning pad was developed in 1913 by the Brillo Manufacturing Company. Brillo steel wood pads are composed of a fine grade steel wool pad embedded with a pinkish soap and baking powder. They were originally used to clean and polish [[aluminum]] cookware and utensils. Other Brillo products included All-Purpose cleaning pads made from [[polyurethane]] foam and Scrub n Toss pads composed of a dual layers of white([[rayon fiber|rayon]]/[[polypropylene]]) and blue ([[polyester fiber|polyester]]). [Purex Industrial] A registered trademark for a series of cleaning pad products. The original Billo steel wool cleaning pad was developed in 1913 by the Brillo Manufacturing Company. Brillo steel wood pads are composed of a fine grade steel wool pad embedded with a pinkish soap and baking powder. They were originally used to clean and polish aluminum cookware and utensils. Other Brillo products included All-Purpose cleaning pads made from polyurethane foam and Scrub n Toss pads composed of a dual layers of white(rayon/polypropylene) and blue (polyester). Soap is soluble in water. Steel will rust and degrade. May contain trace levels of toxic or carcinogenic materials. This page was last edited on 29 April 2016, at 14:14.